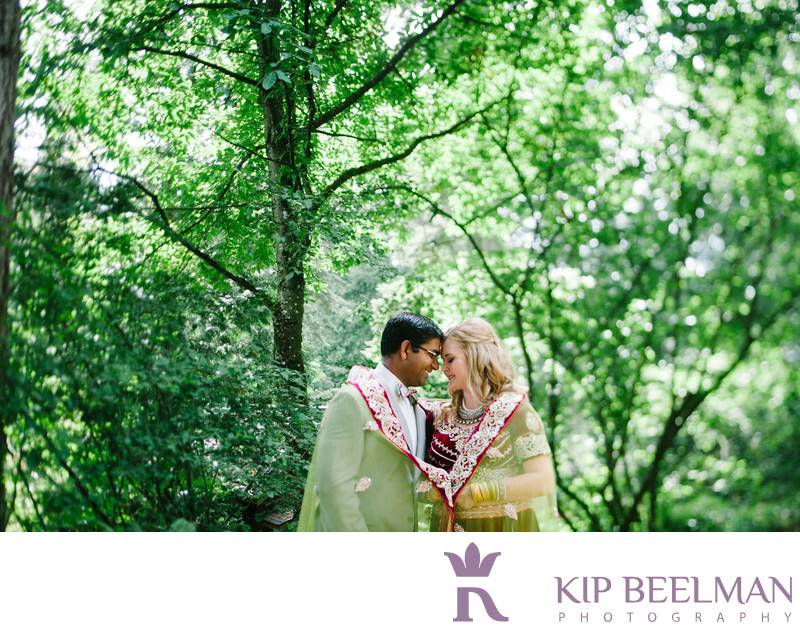 This Indian wedding took place 30 minutes north of Seattle nestled in the forest on 12 gorgeously landscaped acres of Bella Luna Farms. The property features organic gardens, ponds, and open fields amid timbers perfectly epitomizing Pacific Northwest beauty and a perfect venue for stunning wedding photos. The multiple buildings made of stone masonry and wood located throughout the property are perfect for hosting different parts of the day from preparation, to cocktail hour and on to the ceremony and reception in a style that is elegant yet unassuming. After an intimate Mehndi ceremony where the elaborate henna is applied to the hands and feet the bride and bridesmaids continued their preparations while the groom lead his Barat. Wearing western clothing and adorned with a giant, red safa, he lead the family and guests from the location of his preparations to the pond-side location of the ceremony atop a white horse and amid traditional drumming and dancing. The bride appeared wearing a beautiful bridal sari and traditional jewelry. The ceremony began with her circling him 7 times before he ultimately applied the chalky, bright red sindoor to the end of her part before ending with a kiss. This image was taken a few moments later in one of the many wooded sanctuaries found everywhere at Bella Luna Farms. The blurring effect on the sides was achieved by using my 45mm tilt-shift lens while they simply stood together still riding high on the emotion of having just becoming married. The rest of the evening comprised of their lovely reception hosted by the culinary team of Lisa Dupar catering under the twin-spired, open-sided sailcloth tent atop Bella Luna’s ample collection of French and English antique tables. Dancing was under a canopy of vines in the Grape House and was powered by none other than Austin Beaver. Mini pizzas from Bella Luna’s pizza oven and the ice cream sundae station kept people happy late into the night while the dancing continued and guests hammed it up in The Lightning Booth. Lauren from Manette Gracie Weddings & Events kept everything running like clockwork for this amazing wedding. Location: 18432 Snohomish Ave, Snohomish, WA 98296. Keywords: Estate wedding (24), Garden Wedding (15), Indian Wedding (3), Outdoor Wedding (72), Snohomish (12).